The general hypothesis related in this book can be formulated as follows. Early history of China up until the XV century A.D. is in fact the history of Europe and the Mediterranean region, Byzantium in particular. Historical chronicles telling us about Europe were transplanted to China in the XIV-XV century A.D. the earliest. 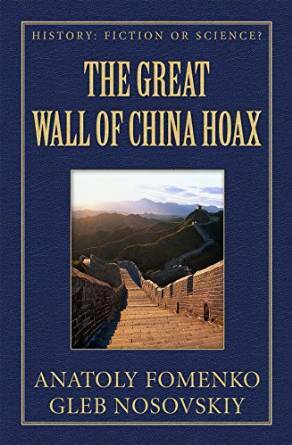 Today it is considered that the construction of the Great Wall of China began in the III century B.C., allegedly as a protection against northern nomads. The argument that the wall had been repaired during those two thousand years is dubious. Only a rather recent construction is worth being repaired, otherwise it will become obsolete and just wreck. This is what we observe in Europe, by the way. Old defensive walls had been demolished, and new, more solid walls built in their place. For instance, many fortifications in Russia had been rebuilt in the XVI century. And yet we are told that the Wall of China, once built, remained unchanged for two thousand years. We are not told that this is a “modern wall recently built in the site of the old one,” but that this is exactly the wall that had been built two thousand years ago. This is extremely strange, not to say more. When and against whom had the wall been built? According to the new chronology, the “Chinese” history before the XV century had in reality been unfolding in Europe; therefore, the Wall of China could not be built before XV century A.D. And, naturally, it wasn’t built against spears and arrows, even copper- or stone-tipped, of the III century B.C. Such walls are needed against firearms. The construction of such fortifications began in approximately the XV century, with the invention of cannons and siege weapons. There are many preconceptions concerning the history of China. It is presumed to be exceptionally ancient, a lot more so than European history, and its datings are said to be perfectly reliable. The basics of Chinese chronology are believed to be so firm that it serves as a classical example of an indubitably ancient and reliable chronology. There is a popular misconception about Chinese chronology being based on the “ancient Chinese” astronomical records, which permit to date the events of the “ancient Chinese” history without any ambiguity whatsoever. This example makes it difficult to believe that the history of Europe, Egypt and Asia Minor is as brief as the new chronology claims it to be. Moreover, one must naturally wonder about the possible reasons why the documented history of China begins thousands of years ago, remaining reliable nonetheless, whereas the much shorter history of Europe contains so many errors. Could it really be that the Chinese have maintained the chronology and history of the last six thousand years unbroken and distortion-free, whereas the history of every other nation is a millennium old at best, and filled with errors? Basically, Chinese history looks like a perfect paragon that makes it hard to imagine the Scaligerian version of documented European history to be erroneous to such a tremendous extent. The authors give a brief description of the real situation with Chinese history and chronology as opposed to whatever is advertised. The authors are far from claiming that their reconstruction is complete. The work on the reconstruction of Chinese history has only just begun.